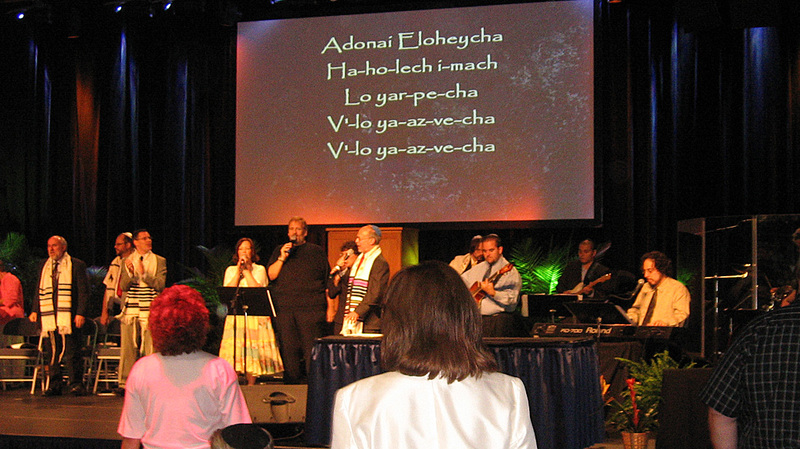 In July 2007, we took a trip back east to the annual Messiah Conference in Grantham, PA–the largest annual Messianic Jewish conference in the world. This year, we had an exhibit in the cultural center to introduce the conference attendees to our ministry. Pictured right, our helper, Simone, is explaining about our various resources, which are displayed on the table. Pictured above, Kevin is the small figure at the center of the photo (click to enlarge). In addition to our exhibit, Kevin was invited to teach a message of vital importance to the health of the Messianic Jewish Movement, “The Gentile Believer in a Jewish Movement”. 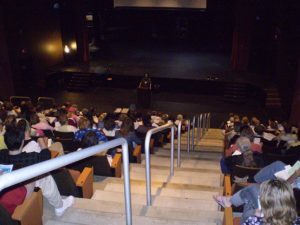 The auditorum was packed as Kevin ministered to about four-hundred conference attendees. Finally, Kevin also led worship after the main evening service as well as played piano for the Saturday morning Torah service. Pictured left, Kevin is at the piano praising Adonai with his friends Sue Samuel, Mark Dayan, and Matt Davis. The Geoffreys: (L-R) Hosea (1), Isaac (8), Esther, Josiah (3) and Kevin. The Messianic Life: Being a Disciple of Messiah and it’s complementary Leader’s Guide, Perfect Word’s third and fourth books in 12 months, published June 21, 2007 and August 27, 2007, respectively. The Messianic Mo’adiym Devotional, Perfect Word’s second book, published March 12, 2007. The Messianic Daily Devotional, the first full-length book from Perfect Word Ministries, published August 7, 2006. 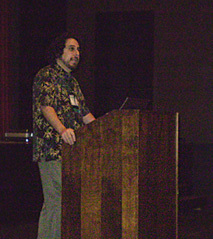 During the 2006 IAMCS Rabbi’s Conference, Kevin received interim ordination (licensing) with the IAMCS as a “Messianic Jewish Teacher.” In addition to this first ordination, Kevin was also given an equivalent ordination from Jewish Voice Ministries (JVMI) in an informal service at the Geoffrey home. The ordination was performed by Jonathan Bernis, a pioneering Messianic Rabbi and Jewish Evangelist, and the Executive Director of JVMI. 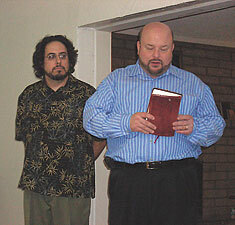 Also in attendance were several of our friends who are leaders of Messianic Congregations here in Phoenix. During the service, Jonathan explained that ordination is a recognition by people of something that Adonai has already established. He went on to discuss the special calling and ministry of the Teacher, saying that a man so called is himself a gift to the Body of Messiah (Ephesians 4), yet has a great responsibility, and will be held to a high standard. (James 3). Both the JVMI and IAMCS ordinations are intended to result in full ordination following a period of study, discipleship, and review by other fully ordained leaders. Pictured above, Kevin listens intently as Jonathan explains about the calling, ministry and responsibility of being a Teacher. Launched Preparing the Way, Perfect Word’s monthly audio teaching ministry. 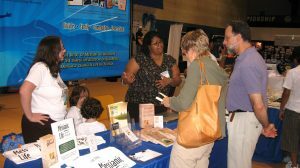 In 2004, Perfect Word continued resource development and began travel across the U.S. to minister in various Messianic Jewish congregations and conferences. 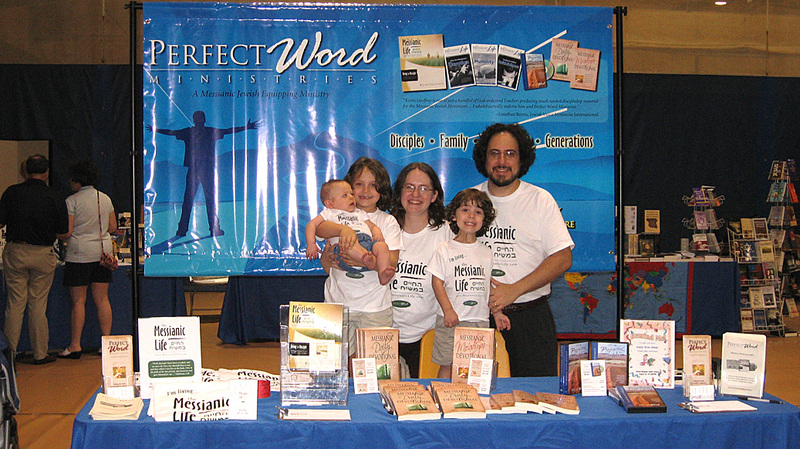 Perfect Word’s first monthly print publication, The Messianic Life, launched in late 2003. Perfect Word Ministries, Inc. incorporated as a 501(c)(3) tax exempt Arizona non-profit ministry. Kevin ministered nationally as a seminar and conference speaker and internationally as a regular contributor to a teaching magazine and as one of several teachers on a widely-distributed video series.